I remember that night in the kitchen when I stroked Chinook’s thick white fluffy neck and his cosmic eyes looked back up at me. Chinook was clown-like. He was black and white with polka dot spots. He was strong but soft, fluffy but shaggy and from his one blue eye -- fell 3 black spots that looked like tears. As my hands passed over his leather buckle collar I wondered, as I often had, how safe it was to have something designed not to break around his big, beautiful neck. The next day Chinook was dead – killed by the collar I put on him to keep him safe. His collar had become snagged and as he struggled to get free, it twisted and strangled him. I wasn’t there to even try and save him. He couldn’t break the collar and he couldn’t slip out of the twisted collar. What may sound like a freak accident is not. Collar accidents occur far more frequently than is realized by caring, but unsuspecting, dog owners. 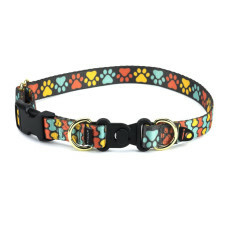 Collars get snagged most commonly in the backyard or inside the home in our dogs’ safe environment. The number one most common accident is when two dogs become entangled while they are neck biting in play; this is also the most fatal accident. Multiple dog households with active players are in particular danger. It happens so fast. One moment your dog is happy, playing and loving life and the next moment the life is being strangled from him. Collar strangulation accidents leave deep scars for all of those involved. On average, we receive reports of one to two collar accidents every week – and that is from dog owners who take the time to write or call. We know the number is actually higher. The KeepSafe® Collar, invented through years of research following Chinook’s death, is the only safety collar specifically designed to release for safety and free your dog from danger. This is so important because the vast majority of collar accidents involve an almost immediate twisting of the collar, preventing a dog from slipping out of his collar. The KeepSafe Collar is the only collar you can have on your dog when you walk out the door that will release and protect your dog when you are not there should he get into trouble with his collar. 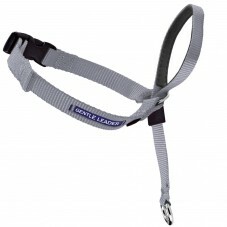 In today’s world, your dog may have a wardrobe of high-quality, solution-oriented products from the Gentle Leader or the Easy Walk Harness for walking; it would be wise to have the KeepSafe Collar with identification for his daily wear collar too. We all know the importance of identification and microchip information for your dog. The KeepSafe Collar with identification is the one tried and true “peace of mind” collar that your dog can wear unsupervised and still be protected. 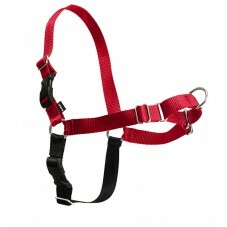 In addition, the KeepSafe Collar can be used securely with a leash by overriding the breakaway buckle with a leash snap. Being involved in collar safety and breakaway technology for over 10 years, I have developed a personal theory based on statistics – if six people are randomly chatting about dogs – at least one of them will have a close call with a collar accident or know someone who has. Have you had an experience concerning the safety of your dog’s collar? We invite you to try the six person theory and let us know the results. A dog’s neck is one of the most vulnerable parts of their body. When you embrace your dog with loving arms, please consider what else you put around his neck. Originally a New Yorker, Tenney is a Cornell grad, a former Animal Control Officer in New York, worked in Washington, DC in animal welfare and served as a Peace Corps volunteer. Rural Virginia has been home to Tenney for over 20 years where she keeps a large animal family safe and happy and enjoys looking for bear tracks in the Blue Ridge.